The Good, The Bad and The Ugly Star Wars Clone Wars Lithograph by Brian Rood is a limited edition print of characters from The Clone Wars television series. 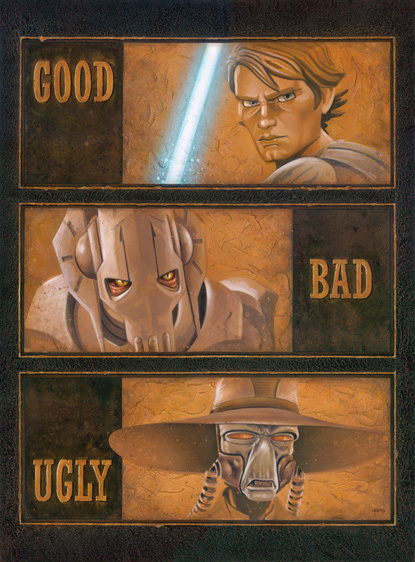 Featuring Anakin Skywalker, General Grievous, and Cad Bane; this awesome reference to Clint Eastwood's The Good, The Bad and The Ugly makes for a unique artwork that any Star Wars fan would adore. This piece comes with a certificate of authenticity. Brian Rood is an artist who has created artwork for nearly every major licensor of Star Wars merchandise. His art can be found on everything from bedspreads to fine-art reproductions. He most recently created the cover art for the Star Wars Special Edition 40th anniversary issue of Time magazine. He has provided illustrations for multiple Star Wars projects including the The Essential Reader's Companion and Star Wars Galaxy Series 4 and Series 5 card sets. 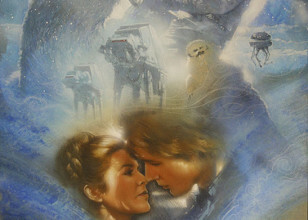 His work can be found inside the original Blu-ray box set release as the Empire Strikes Back Key art. Brian Rood and Chris Trevas have provided all the key art for Star Wars Celebration V, and the two illustrators have helped create all the illustrations used for the Lucasfilm pavilion the past two years at San Diego Comic-Con. 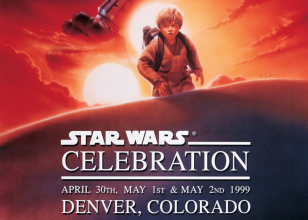 He has also provided exclusive prints for Celebration IV, Celebration V, and Celebration VI, where he also provided art for the convention badges and merchandise along with Chris Trevas. 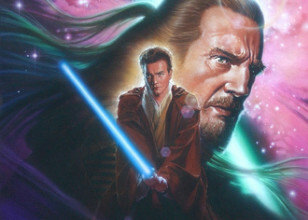 In addition, he illustrated the packaging art for dozens of Hasbro action figures sets and provided illustrations for the multiple short stories including A Fair Trade, which was published in the magazine Star Wars Insider 129. Along with the extensive work he does for Lucasfilm/Disney publishing, he has a wide assortment of fine-art reproductions that can be found throughout the Disney parks as well as galleries worldwide. 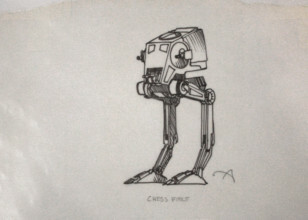 He works on a regular basis with Star Wars fine-art licensor ACME Archives and is one of the original published Star Wars artists on their fine-art line. In December of 2017 his work was the featured cover art for both Time Magazine and Star Wars Insider, and Harper's Bazaar ran a five-page section of Brian's art portraying five well-known supermodels composed into classic Star Warsscenes. The Read-Along Storybook and CD releases for the original trilogy, Episode IV: A New Hope Read-Along Storybook and CD, Episode V: The Empire Strikes Back Read-Along Storybook and CD and Episode VI: Return of the Jedi Read-Along Storybook and CD, feature illustrations by Rood. Rood also illustrated the World of Reading title A Leader Named Leia.